Guests can gleam a lot from a sign. In the case of Tortuga Tavern, there are actually three signs that tell the tale of the restaurant. There are two that are utilized to tell the story of the restaurant’s current owner and one for the Magic Kingdom historians. Let’s start off with the appetizer, the park history. Tortuga Tavern is filled with many items that tell the tales of the dead and not so dead men from Pirates of the Caribbean. Tucked away in the rafters, however, is a sign of days gone by. 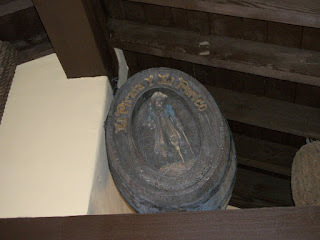 Literally, it is one of the old signs for the pub’s previous incarnation, El Pirata Y El Perico. While this is a great little nod to the history of Caribbean Plaza, it doesn’t really progress the current story along, so let’s jump to it, eh? The current name given to this Adventureland eatery is Tortuga Tavern and it is run by a former barmaid named A. Smith, that’s here there on the sign. The A. stands for Arabella. If that name sounds familiar to you, then it is likely that you picked up a book or two in the Pirates of the Caribbean Jack Sparrow series once upon a time. The young adult series dealt with Jack as an adolescent who set off for adventures on the high seas with some acquaintances turned friends, one of whom happened to be Arabella. 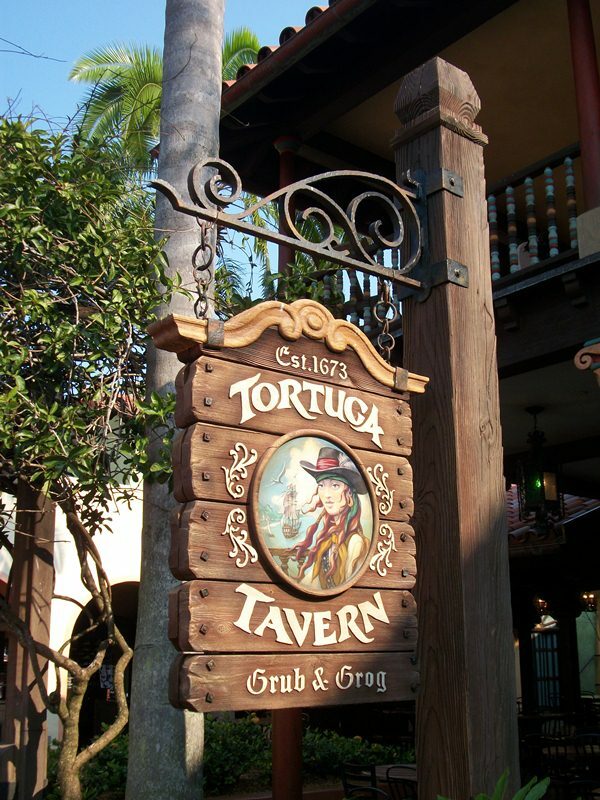 Before we get deeper into Arabella’s story, it is worth noting that the date Tortuga Tavern was established, 1673, is a tribute to the opening of the Pirates of the Caribbean attraction and Caribbean Plaza in the Magic Kingdom in 1973. Now, back to Arabella. After her adventures with Jack, whom it is said still visits the pub when he is in port, Arabella returned to Tortuga. When she left she had been but a barmaid in her father’s tavern, but she returns a much wiser woman, who clearly knows how to market to the local patrons, I mean just look at the sultry portrait hanging outside. If you are outside, you may notice that there is a wagon filled with casks and crates for the restaurant. Included amongst the supplies is another bar shingle, this one for The Faithful Bride. It shows a lovely, young, virtuous woman, not necessarily the type of advertising to attract pirates in for a pint. Remember how I told you Arabella had once worked for her father? 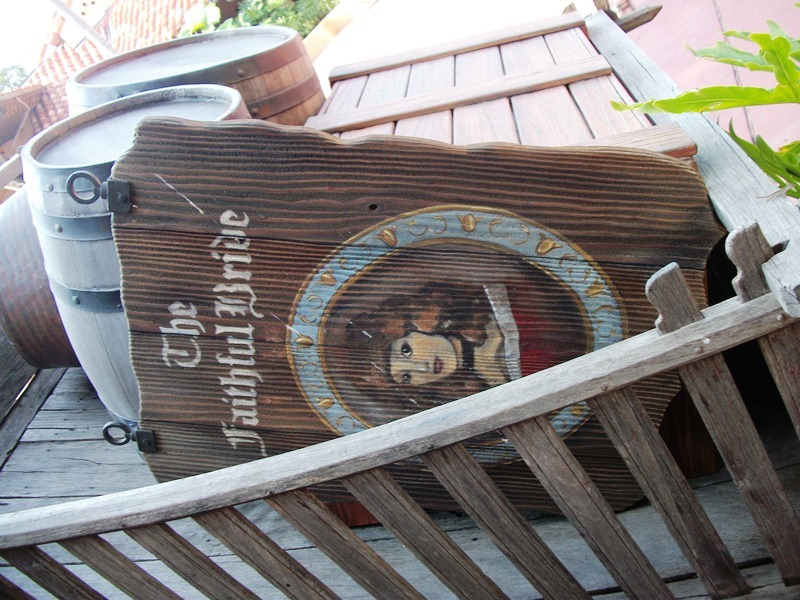 Well, as it turns out Tortuga Tavern was once her father’s place of business, The Faithful Bride. The woman pictured is Laura Smith, Arabella’s mother. As it turns out Laura was not exactly the faithful bride, kidnapped and murdered by pirates, that everyone had thought she was. It turns out it really was a pirates life for her. Just like a treasure map, these signs scattered about Tortuga Tavern are charts to far off places and great adventure. Of course, you have to know how to read them and where to find your next clue if you want to stay one step ahead of the pirates. As for me, maybe I’ll just settle down in a chair for some grub and grog. My kids love the young Jack Sparrow books, and it's nice to know where Arabella came from! Thanks! LeAnn - It's one of those great stories that if you didn't recognize it from the books, you wouldn't even catch it. I hope this will give your kids something to look forward to on their next visit! It's a shame Arabella isn't around for meet-and-greets.